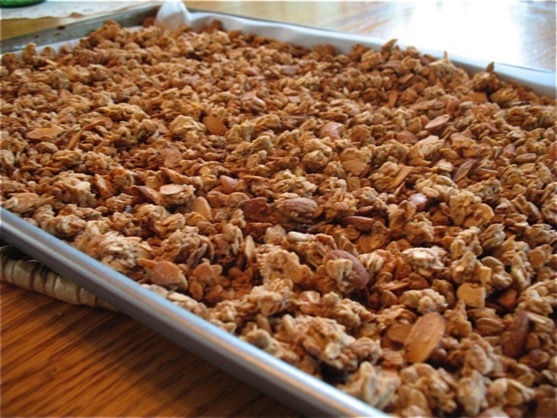 Peg converted this non-gluten-free granola recipe. She mixes this into her yogurt in the morning for breakfast. Most medical professionals say gluten-free oats can be tolerated in limited amounts [up to 1/2 cup per day for adults]. They also suggest restricting oats for one year for those newly diagnosed. Some celiacs will react to the protein found in oats [avenin], just as they react to the proteins in wheat, barley, rye. If you choose to add oats to your diet, please make sure they are gluten-free purity protocol oats. To learn more, please read our oats article. Combine first 5 ingredients in a large bowl. Place over medium heat and cook - stirring often - until the sugar dissolves. Pour hot mixture over the dry mixture. Stir until thoroughly blended. Mixture will appear wet. Spread evenly in a large jelly roll pan or a shallow pan with sides. Bake at 300 for 1 hour, stirring every 15 minutes.